« Ban Driven Grouse Shooting to save the Hen Harrier: Petition exceeds 73,600 signatures. Annie one of 30 tagged Hen Harriers reported as confirmed dead or missing between 2007-2015. The information below, regarding dead or missing Hen Harriers fitted with Satellite Tags between 2007 – 2014, was provided by Natural England to Terry Pickford in reply to his Freedom of Information Request. Summing up Natural Englands response, of the 27 Hen Harriers tagged between 2007 and 2014, 25 are now known to be either dead or missing. 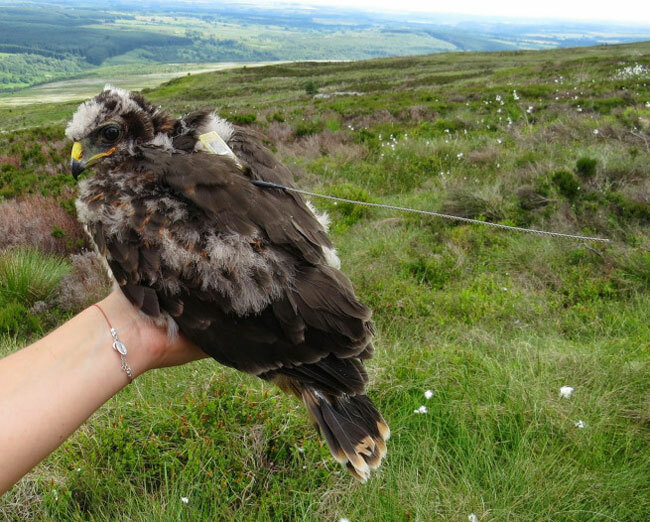 In 2015, Natural England fitted five satellite tags to hen harriers in northern England. All five of these transmitters/birds are now missing. Whichever way we view these statistics they make for terrible reading. This is compelling evidence why we should support Mark Avery’s petition to ban all Driven Grouse Shooting. Please everyone retweet this appalling detail. Thank you for your request for the information detailed below which we received on 13 July 2016. Please find our response to each of your questions below. known to be alive? If this is not possible how many of these birds are now confirmed missing? In 2016, Natural England and the RSPB will be putting satellite tags on a complement of the year’s broods.This is ongoing work therefore and we do not yet hold this information. We are therefore applying exception 12(4)(a) – Information Not Held – under the Environmental Information Regulations 2004. This exception is applied when the public body does not hold the information requested. birds and 24 missing? If these figures have now been updated can you please supply the updated figures please? be dead rather than “missing”. 3. With regards to the above are you now able to provide any information of the locations where any of the tagged Hen Harriers went missing, or where their tags stopped transmitting? charge in any format or medium, for the purposes of research for non-commercial purposes, private study, criticism, review and news reporting. You must re-use it accurately and not in a misleading context. Buildings, Whittington Road, WORCESTER, WR5 2LQ. should you have any concerns with the service you have received in relation to your request and wish to make a complaint or request a review of our decision, please email me at [Natural England request email] and I will arrange for a review to take place. If you are not content with the outcome of that complaint, or the review of our decision, you may apply directly to the Information Commissioner for a decision. Generally, the Commissioner cannot make a decision unless you have exhausted the complaints procedure provided by Natural England. What the heck is a “sensitive site”? Especially one that is so sensitive that you have to hide it within 100km2? It really makes no sense to hide the detail, it could easily be released under a licence restriction. If they are not going to release the grid ref…. would they describe the habitat type at each “end of signal”? I agree. What on earth can be so sensitive about a site where a tag ceased transmitting as to render the location unavailable to tax payers who funded it? I think we need to know more about these so called sensitive sites and why they are classed as sensitive. Please continue the pressure for more information. Editor’s Comment. In reply to you both, a sensitive area in this context, is a grouse moor owned by a person with money, power and influence.